Michelle Obama took the stage on the opening night of the Democratic National Convention in Philadelphia tonight to offer her support for presumptive nominee Hillary Clinton. The First Lady began her speech by discussing the influence that individuals who holds the office of president have as a role model for children. "This election and every election is about who will have the power to shape our children for the next four or eight years of our lives," she told the crowd assembled on the convention floor. "I am here tonight because in this election, there is only one person who I trust with that responsibility, only one person who I believe is truly qualified to be president of the United States, and that is our friend Hillary Clinton." Mrs. Obama also mentioned America's violent history, saying, "I wake up every morning in a house built by slaves." She went on to note the historicity of Hillary Clinton's nomination as the first woman to ever run for president as a nominee of the two major parties, saying that, because of Clinton, her children now take it for granted that a woman can be president. 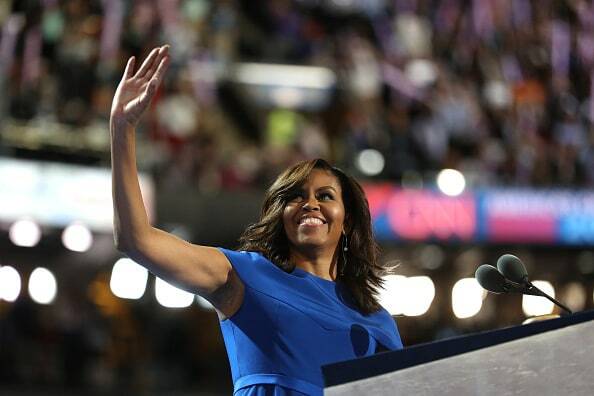 The crowd at the DNC greeted the First Lady with loud cheers, and the internet resoundingly agreed, calling for a future Michelle Obama presidential campaign. BARACK: So that's how it feels huh? JAY: You get used to it.